Hot today, up to 32 C and probably warmer out in the open with no shade. We started off in Kelheim and after braving that 22% grade back down (still not fun, especially with the bikes fully loaded) we cruised across the old town to the boat docks and stuffed fifty plus bikes into a riverboat for the 45 minute ride up the Danube gorge just upstream from Kelheim, which saved us 300+ metres of climbing on the first few kilometres south of Kelheim. 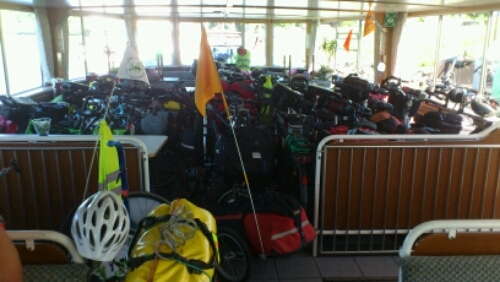 Lots of touring bikes stuffed in the forward lounge of a Danube riverboat. The gorge was spectacular; after ten days biking along the Danube it was nice to see things from the water for a bit. We even saw a cave that had supposed been used by Donau pirates at one point, which nearly lead to this post being titled “The Pirates of the Danube”! Because of the ferry schedule we started later than usual and got to bike well into the hot afternoon, not getting to Ingolstadt until 1500 or so. Ingolstadt looks lovely, an old university and army town full of neat buildings. The hostel is an old 19th C barracks on the edge of the old town, with massive thick brick walls keeping the worst of the heat out. I’m planning a loop around the old town and its surviving fortifications tomorrow when we ride out; we walked part of the town tonight but heat and fatigue kept me from seeing everything I wanted to see. Off to Donauwörth tomorrow, weather supposed to be just as hot and about ten clicks more that today’s fifty-some km!